and before I finish it.. I want to know... what do you want to know? 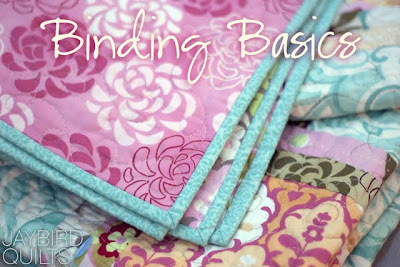 PS... this post is going to be in addition to the other 2 binding tutorials I've done. The goal is that it'll fill in lots of questions I've been asked as well as go over the basics for those just getting started in quilting. How about the mitered corner, any hints on getting them perfect? I actually show how to do that in my first binding tutorial but I can add more photos if you want me to. Favorite thread and needle you use for hand sewing the back on. Hand vs. machine finished bindings. I do hand stitching most of the time but would like some tips on how to get the stitch in the ditch when machine finishing. Quick methods (ie machine?) for those quilts that just need to get done and out the door. BTW the quilt in that photo is delicious. binding can be such a grey area for new quilty peeps. glad you are gonna show everyone the in's & out's of binding. When I do small quilts, I don't use continuous binding, but one strip on each side, but my corners never look the way I want them to. Would love some advice. Thanks! Looks like you've covered the topics either in your coming-soon or in your previous tutorials. Good job! Julie, I'd LOVE to know how to do a mitered binding on irregular angles like a tumbler quilt that has not been trimmed down. I'd love to see your hand stitch, too...I like a ladder stitch but I know most people use a whipstitch. I would like to know about converting measurements into Metric. I have no idea how to do that. I would like to hear about what kind of thread to use for hand stitching your binding, one strand or two, what is a neat way to secure the thread when you are at the end of the thread, and how to vary the widths of your binding...always 2 1/2 inch strips for the double fold binding...what about 4 inch? I better go read your other tutorials. You might have already covered these. Thanks for doing this piece on bindings, Julie! I'm looking forward to what you have to say regarding bias strips vs. "regular" strips. Does it really make a difference? I really can't wait for this post. Whenever it is time to bind a quilt, sweat beads start popping up on my forehead. I feel like there have been so many times when I've ruined a quilt that I really loved with a poorly constructed binding. It's heartbreaking! How about binding around other than 90 degree corners? Say if you want the end of a table runner to be pointed so that the corner is 45 degrees. Or binding around a hex shape. That would interest me. I echo the commenter who wants to know about hand stitching the corners down. I can get them pinned down perfectly, but I don't quite understand the best way to stitch them that hides the thread and keeps the corners neat. Also, hints on getting the binding straight so when you are hanging on a wall the edges aren't wavy. Could go on and on. I am REALLY looking forward to this tutorial. You explain things so well. Thanks in advance! Looking forward to your tutorial - there will a tip I just can't live without I'm sure. I love to hand stitch on the binding so how to keep it invisible would be nice. A good tip for corners would be so helpful. Thanks so much. I would love tips on machine binding! I always feel bad when I see a lovely quilt with bumpy, messy corners. I have to refrain myself from making a comment...lol. I would also like to see a tip on machine binding. I am getting better at finishing my binding by machine, but it isn't quite as nice as I would like it to be. I usually have to go over a few places to be sure the stitch in the ditch on the front actually caught the binding in the back. How to bind a scalloped edge. And an inside corner. Finishing the quilt with the Machine Binding. I don't EVER finish it by hand...and dont ever want to. But I would like to become a better Totally binding by machine. I was lucky enough to find an excellent video tutorial which shows you how to hand stitch, but it's true that my binding was very unsightly before I learnt how to 'hide' my stitches. I would be interested to learn how to bind things other than quilts (bags etc..), I find this kind of binding a bit intimidating.. I second or third the requests for instructions/tips on binding around inner/outer corners that aren't 90 degrees like hexagons. I love that you're going to do another biding tutorial.....ever since you posted the first one, i've used it for all the quilts i make for now on....i've also started hand stitching the binding to finish up, but i can never seem to get the corners right, so any suggestions on that might be helpful. How much sewing does one need to do on the mitered corners? It seems like I can make the binding strips, sew them on, turn the corners ok, but when it comes to hand-sewing the miters, I choke! I dont' know if I should just sew on the edge, or go into the miter and stitch it down? ARGH!!! Your prior tutorials were so great, I wouldn't know what you need to add! I've noticed a lot of people asked about stitching in the ditch on machine binding. I always machine bind & discovered a simple solution, I think, & that's to iron the binding away from the seam after first attaching it. When I do that I don't ever have the problem of going out of the ditch, or failing to catch the underneath binding. Hope that makes sense! I don't need to know anything-- I am a binding master! Humble, right? I think a lot of people have questions about how to finish the binding nicely. Most quilters I know do a tucking method rather than continuous binding because they don't know how to join the tails of beginning and ending strips. Corners! There can never be enough tutorials for me on them! I''d love to see more about perfecting machine binding ...thanks so much! HELP NEEDED: I can't seem to make a nice finish on the binding. Either I trim the angles (to fit together) too short and too short or I forget to fold it back to make a nicer finished edge. Totally blows the rest of my hard binding work out of the water to have a yucky finish. [big pout] Would love to hear how you manage this! I was just looking up sites to try to remember how to cut/sew a piece to give me a long bias strip. Found one great site but I need some photos to help me understand it all. Any tips for the hand stitching part? What kind of stitch do you use? I think I just made my stitch up, I never learned it properly anywhere. I am wondering why most 'professional' quilters don't do a self binding from the back ; is this a no-no in the 'real quilter's world' ; or I'd like to hear what you think about it . Or is it just a preference ? I do like the look of the regular binding , but the self binding saves a lot of time . I'd like to hear what some other quilters think about it also , please ! I want to learn more about machine binding. I can seem to make the front look good, but the back always looks a little off - I don't always "catch" the binding right. Also, what are the pros and cons to machine binding vs hand binding? Everyone concentrates on the binding but the quilt needs to be perfectly square so the mitred corners turn out perfectly. I found a great tutorial on hand stitching the back but would LOVE some great tips on how to machine binging on 100% (front and back) for smaller projects. Best way to end the binding without the "hump". Folding the top piece of binding over the beginning piece of binding leaves alot to be desired. Sewing the first piece to the last is nice, but how to measure to make it come out even? Glad you're tackling this one. Advice on hand-stitching the back would be fabulous. I feel like my stitches look like a small child was given a needle, thread, and free range. I am disappointed every time. I get so turned around just putting the binding strips together, I never seem to sew them together correctly - it looks easy, but for some reason, I can never remember which way to put the fabric together and then which way to sew it. Use of a scrapy French double fold binding with shorter length strips (say 10-12 inches) (vs long strips). Hints and tips for cutting/sewing various prints as binding (stripes, polka dots, etc) so they will look the best, especially as go around corners. Curvy bindings vs all straight sides. How about troubleshooting, like what to do when you realize you've cut the binding ends too short so they don't meet or you have a fold/lump or the backside binding is a little too scant in places. Thanks! A perfect way to machine sew the binding. I am so NOT hand sewing a binding on a quilt but there has to be a trick. Mine look ..okay.. but I would love any pointers I can get. I have trouble on continuous binding with fitting the 2 end together where they meet at the end. I'd like to know specifically why some quilters choose to make their binding with the grain, and others choose to cut it on the bias. Most books I've looked at say go with the bias...? I'd like the "complex" binding tutorial on curves, scallops, and wedding ring quilts. I have heard it before that you machine stitch the binding to the top of the quilt and then hand stitch the back. If it is I have made a mistake by machine stitching for both sides together. The top will be perfect while the back will be a bit off is what happends. But I do not cut my own bias tape. I end up buying the quilt binding from Jo-Anns. It would be nice to know how to work with that. Store bought vs. homemade that is. Also thank you for taking the time to do this. Hi Julie - thanks for doing a binding tutorial - I'd really like to see some suggestions on finishing the ends of the binding. I would love to know how to bind curves. I'm trying to make the cutest Valentine potholders and I cannot get the binding to work at all. I know that's not really a big quilt project but I'd love your help, please. Thanks so much! Alright Julie, I did look over your tutorial on the perfect binding. Totally get it! What I would love to see is how the back is hand stitched. Because even the books that I have gotten from the library do not even show it. Also the binding that I picked up from Jo-Ann's is the double fold bias tape from Writes. I will wait to see your post on that. Also after seeing your tutorial I will probably go on to make my own. It seems to be more cost affective. Thank you again Julie! I would like to know how to put a binding on those wall hangings in which I don't want the binding to show in the front. Because I only know how to put binding on one way I can never get the corners right when folding it all the way to the back (the mitered corners are all bunched up). Thanks Julie for the link to the first binding for the corners. I've ALWAYS made the mistake of doing the 45 then folding back, but I stitched over the fabric to 1/4" and when I went to do the front, it's always wrong! I don't think I've ever grasped that there is really supposed to be an unstitched flap there until I saw your photo! DOH....I get it now! Another vote for machine binding! Thanks Julie! Yes, everyone always shows how to make the corners on the front of the quilt. But I have a problem knowing which way to turn those corners, and also have problems with making the mitered corner on the back. Can you go over your technique for that? I usually end up with my corners folded different directions, and the back always looks a mess. I can't reply directly to your comment... I did show how to do that in my follow-up post to this one. Would love to know about how to sew on praire points. Would love to know the difference in strength of a flange binding vs a double fold binding. of the binding with the bottom fabric.